"The Tools of Contemporary Masters"
Since 1980, Gamblin has handcrafted luscious oil colors and contemporary painting mediums that are true to historic working properties, yet safer and more permanent. All of Gamblin's oil painting materials are handcrafted at the company's wind-powered factory in Portland, Oregon. This is a paint you can trust for permanence and studio safety — from the industry leader. Traditionally, gesso (Italian for "gypsum") was applied only to panels. 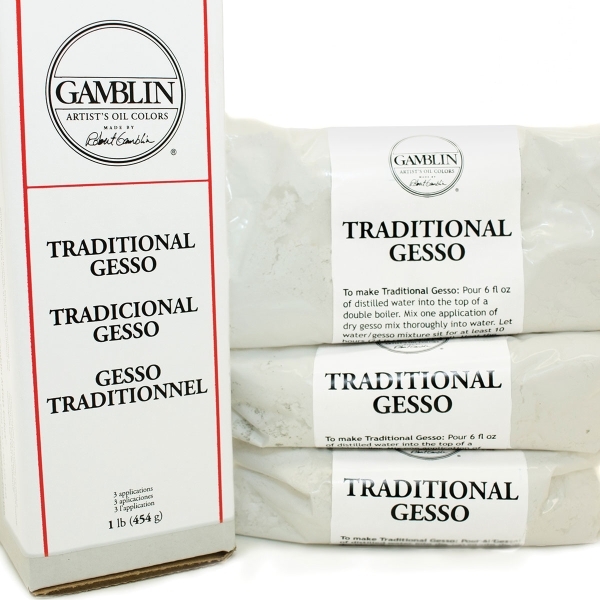 Gamblin's Traditional Gesso is a classic absorbent ground for oil panels which, when mixed with water, forms a luminous painting surface. Use it to recreate the traditional supports and surfaces used by panel painters for hundreds of years. 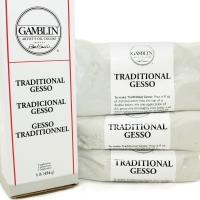 Gamblin Traditional Gesso is a dry, powder mixture which includes Rabbit Skin Glue crystals. The RSG acts as the binder in the gesso when it is mixed with water. 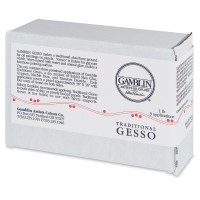 Robert Gamblin recommends applying four coats of this traditional gesso to both sides of thin or poorly braced panels. Gamblin Traditional Gesso is too brittle to use with fabric supports.